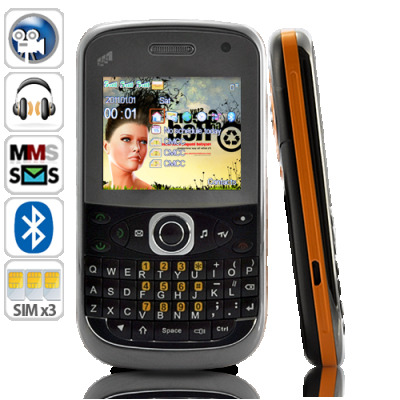 Successfully Added TriPlus - Triple SIM QWERTY Cell Phone (Worldwide Quadband GSM) to your Shopping Cart. Every second counts in today's busy world, so keep your life organized and ready for anything with the TriPlus - Triple SIM QWERTY Cell Phone. With three SIM Card slots and a QWERTY keyboard, this unlocked mobile phone is the ultimate in mobile convenience for today's hustling world of communication. The TriPlus mobile phone comes with three SIM card slots available, allowing you to keep three different phone numbers active inside one single phone. That means the business SIM card you use can be kept inside the same phone as your personal SIM. For good measure, you could also prepare a pay-as-you-go international SIM card inside the third slot, making your next vacation or business trip smooth and easy. With one dedicated phone for everything, it's time to start taking back control of your life. For those who want more, the TriPlus cell phone also comes with solid array of full featured functionality, including: camera and camcorder, video and music player, FM radio, e-book reader, Bluetooth, Java, and best of all: a full QWERTY keyboard. If you need to send a long email, or even just a quick SMS reply, the ultra responsive keys make typing messages and emails easier than ever, saving you more time and offering more convenience. As always, Chinavasion brings you the latest electronics from the world's factory (China) at an unbeatable wholesale price. To see this phone in action and make a killing as a drop shipper or a reseller, click "Add to Cart" right now, and in a few days this amazing triple SIM QWERTY cellphone will be yours. And of course, it comes with our 12 month warranty and next day shipping.